Caulfield, Rosehill, Bendigo, Flemington and Randwick. We take just one horse to the Caulfield meeting on Saturday, Black Tomahawk (pictured) having his third run back from a spell. Whilst suited up to 2000m the Seul Amour six-year-old is not quite there yet, Michael Moroney reporting that "he should run better than last time but he is still a run away from his peak fitness and at this level he probably needs it even longer to be competitive." A horse we are still learning about is our Rosehill runner, the imported galloper Sapphire Of Patch. world alight here and is expected to be at his best over longer trips. "Reports are that he will be looking more ground and wet tracks," Moroney said. Paterangi looks one of our best chances for the weekend, the up-and-coming three-year-old stepping up to 1600m at Bendigo on Sunday. To be ridden from the inside gate by Ryan Maloney, the last start impressive Kyneton maiden winner has progressed nicely. "He will be even better next time in," said Moroney, "but he is building up a good record and whilst he is up in class it does not look an especially strong race." "He is a promising horse who should again prove hard to beat." Lining up in the following race is Rising Stock who has been freshened since a Donald fourth on March 11. "He is a horse who has a few tricks up his sleeve but he has been working well and he looks good. It is really up to him, if he puts his best hoof forward he can finish in the thick of things." Extra Noble is our sole Flemington runner on Anzac Day. Second up over 1700m he can run well though conditions will determine whether or not the imported five-year-old takes his place - "he is definitely at his best with give in the ground," Moroney said. On the same day we have Power Of Patch racing at Randwick and we are looking forward to seeing how he fares up in grade having won his maiden so well at Hawkesbury late last month. 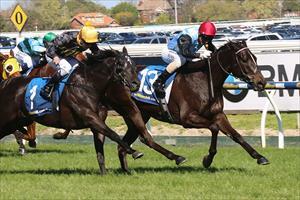 "He is a really nice stayer in the making," Moroney said of the High Chaparral three-year-old. "He has a tricky gate (11) but I like the way he won his maiden and he is again a good winning chance." On to Ballarat on Tuesday were we have Golden Coin making his Australian debut over 1400m with Steven Arnold to ride. "He ran well first up last time in though he does look to be a nice staying sort. He is an interesting runner."